Dillian Whyte says a rematch with Anthony Joshua is off and he is targeting a fight against American Dominic Breazeale in his next heavyweight bout. Whyte had been in talks with Joshua over a potential heavyweight title fight at Wembley Stadium on April 13 but he has now switched his focus. With an all-British heavyweight fight off the cards for now, Joshua looks set to make his US debut against Jarrell 'Big Baby' Miller at Madison Square Garden in June, Matchroom Boxing boss Eddie Hearn revealed. "The Joshua fight is dead. It is not happening at the minute so we move on," Whyte told Sky Sports. "The good thing is I am in a position where I have got options. We wanted the fight, I think they wanted the fight as well but sometimes negotiations break down. 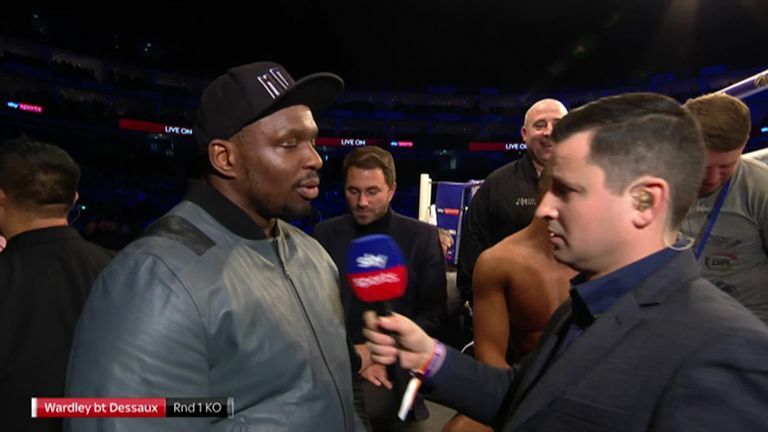 The 30-year-old, who knocked out British rival Derek Chisora in their heavyweight grudge match in December, will now wait for his next opponent to be confirmed, with The O2 - the scene of his last three fights - booked out for April 20. "Negotiations in business are very difficult. The fans don't really see the ins and outs of that. We move on," he said. "I fight April 20 here [The O2] hopefully against Dominic Breazeale, Alexander Povetkin, Luis Ortiz or one of those guys. Let's see what Eddie can deliver in the next couple of days." Asked who he would prefer to fight next, Whyte was clear in his own preference. "Even though I am number one for almost two years he is number three and the mandatory - I don't understand. We want to get to the bottom of that situation once and for all." Hearn has been considering opponents for both Whyte and Joshua, whose last fight saw him knock out Alexander Povetkin in devastating fashion for his 22nd professional victory. "He [Whyte] likes to gamble. He [wants] that world title shot but he wants what he perceives to be his value in that fight and he thinks if he is going to beat those guys, continue to win, his value is going to continue to increase," Hearn said. "There are four guys in the heavyweight division right now and Dillian Whyte is right at the forefront. You have got the other guys trying to break into that spot. Jarrell Miller, Dominic Brezeale, even younger fighters coming through. "Dillian is always ready to fight. If it is not going to be Joshua it will be April 20 and we will sort that all out next week." Miller confirmed earlier this week he had received an offer to challenge Joshua for the WBA 'super', IBF and WBO belts, and Hearn says that clash is close to being agreed. "It is looking very likely at the moment," he said. "If we can't do May or June against Dillian Whyte I think AJ could be making his American debut at Madison Square Garden in June."